2012 E-Max Angry Birds trading cards bring the hugely popular video game to the hobby for the first time. Just when you thought you could get the simple sound of flying birds and falling piggies out of your head, comes this simple set that offers little more than a large checklist of base cards and a handful of foil chase cards. Shop for Angry Birds Boxes and Packs on eBay. 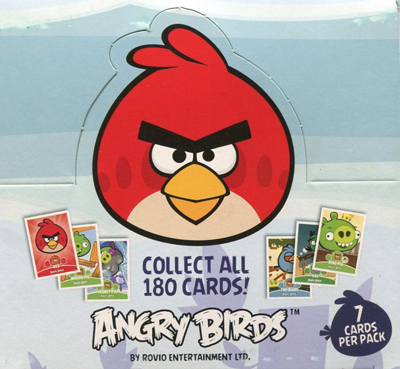 The 2012 E-Max Angry Birds has a total of 180 cards. The first 160 are basic cards with images of the birds and pigs in their familiar in-game settings. Besides a name and number, card fronts also have an icon that's either a boulder, slingshot, crate of TNT or a nest. The idea is to play a game like Rock, Paper, Scissors with them. It's diagrammed on the generic card backs -- all are the same. Foil cards are essentially short prints. Every other pack has one of 16 different Silver foil cards. Four Golden Cards are extremely tough to get, falling 1:36 packs or one in every 1.5 boxes.